Spot Runner, Inc. was the first Internet-based ad agency that makes it easy and affordable for small businesses to advertise on TV. With the website’s revolutionary approach to commercial production, media planning and media buying services, small businesses now have access to a powerful marketing tool previously beyond their means. The charge to the Leader Creative design team was to develop a logo that will suggest or give a sense of Spot Runner’s essential purpose: What Spot Runner does and for whom. It should connect with prospects by being relevant—why Spot Runner matters; how it improves its customers’ lives. 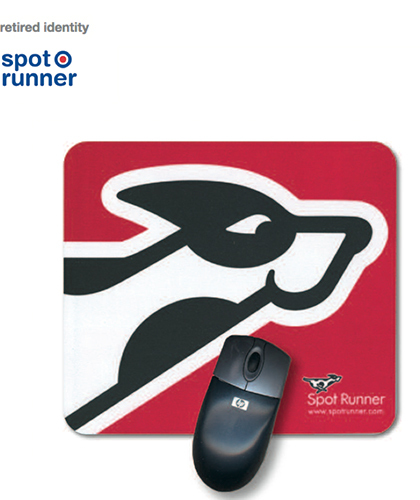 “Spot,” the happy, speedy and determined little dog is the company’s symbol. Simply designed yet possessing great impact, the symbol is highly adaptable to a wide array of media from tiny digital commercial “bugs” to massive signage and all points in between. The Spot Runner identity system suggests one company, one brand—an enterprise wholly devoted to the “little guy:” small business America.